Claiming your school district's page is a great way to test drive the ClearGov platform and get some great insights while you're at it. Claiming is quick, simple and, best of all, free! NOTE: Page claims are reserved for government officials only. 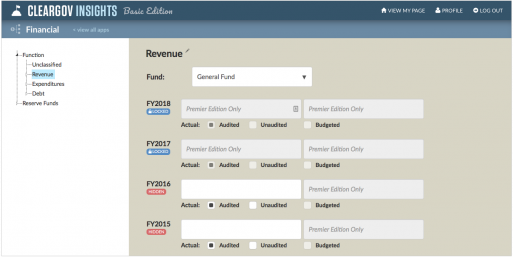 After claiming your ClearGov page, you'll be able to drill into revenue and expenditures to see how your funding and departmental spending compares to similar communities. You'll also be able to visualize trends in your budget that are often difficult to see in spreadsheets. Want to see how your municipality compares to your group of peer communities? Our custom peer group tool allows you to easily define a new set of peers to benchmark your community against. Claimed pages can create one custom peer list with up to three peer communities. Leverage our self-service financial reporting tools to update your ClearGov site with more recent fiscal data. Creating a visual budget has never been easier! By taking a proactive stance on transparency, your school district can drive community support by more clearly communicating key dynamics and better conveying your efforts to eradicate inefficiencies and improve performance. Data is the new lifeblood of modern organizations. ClearGov helps administrators, board members and department heads get on the same page with a common set of empirical data and make more informed and data-driven decisions. Benchmarking has become a critical practice for school districts, but it has traditionally been time-consuming. ClearGov offers easy-to-use tools that enable quick yet powerful benchmarking analyses without complicated spreadsheets.